You may not know much about Qualcomm, but odds are fairly good that you come into contact with their tech daily. Their tech powers the majority of Android phone brands, including Samsung, LG, Nokia, Motorola, and HTC handsets. They also have a reach into most connected devices markets, including “smart” home appliances, cars, wearable tech, and health care. Today, they’ve dropped an announcement that they hope will change mobile data forever… but there’s a catch. For the most part, the new product descriptions Qualcomm dropped this morning are what you’d expect from a company that makes high-tech chips: the next generation of Snapdragon processors is set to be smaller, thinner, lighter, and faster — exactly what we’ve learned to expect over the last 30 years of computing evolution. But one particular new announcement is grabbing the headlines: a gigabit LTE modem. The tech in the new Snapdragon X16 does sound very impressive. It supports multiple spectrum bands, including the unlicensed 5 GHz space, on a single chip and remains small and speedy. The idea is that a phone using this new tech would be able to reach download speeds of up to 1 Gbps (approx. 1000 Mbps) and upload speeds of 150 Mbps. For comparison, PC Magazine’s national 2015 speedtest found that the maximum download speed available any network they tried was 100 Mbps (T-Mobile), and the average speeds ranged from 12.7 Mbps (Sprint) to 19.1 Mbps (Verizon). 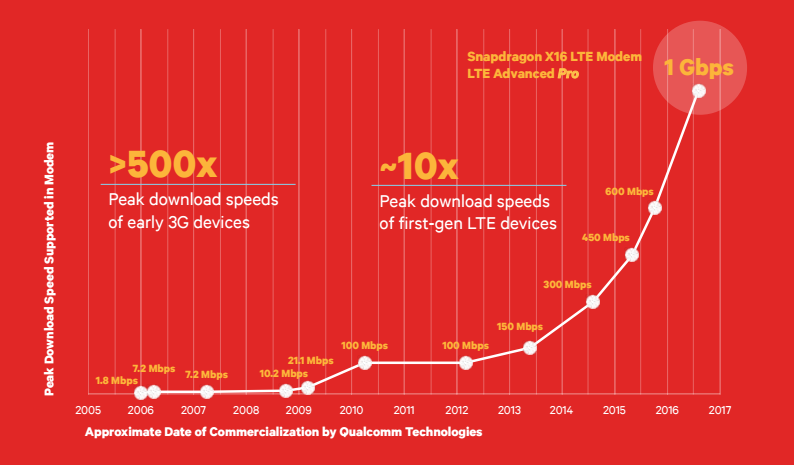 In other words, Qualcomm’s new tech promises to deliver mobile connection speeds ten times faster than the fastest link out there right now, and 50 times faster than the best average connection. That’s huge, right? Well, there’s a caveat, and it’s this: no modem can connect you to a network that does not, in fact, exist. The Snapdragon X16, and future generations of the chip, will be a vital part of speeding up the nation’s — and the world’s — mobile networks, no doubt. If your phone could connect at gigabit speeds, you probably wouldn’t bother with home WiFi at all (data caps and pricing aside). But before the chip, or any competing product, can do that, it needs a gigabit network to connect to and pull down data from. And that simply does not exist. LTE coverage in the U.S. is pervasive, as The Verge points out, but it’s not fast — we rank 55th in the world overall for mobile speeds. But we’re far from the only ones who can’t actually make use of this new Qualcomm tech. The fastest average connection in the world is found in Singapore — small, dense, easy to cover geographically — and even there, it’s still under 40 Mbps. So far, the closest thing to gigabit LTE is an LTE/WiFi hybrid network that launched in South Korea last summer. What Qualcomm’s announcement means, then, is that when the networks exist, the devices will be ready to go. Until then, though, anything being marketed as “LTE gigabit-ready” is pretty much just hype. No matter how ready it is, it’ll be left waiting.